For a while maple might have been a bit misrepresented in the acoustic world, developing a reputation for being too bright for some, and lacking the richer character of other classic tonewoods. But historically, maple has actually been one of the classic tonewoods for other stringed instruments in the violin family. Taylor has voiced its maple 600s to re-introduce its true voice to guitar players, and the results have been amazing. If you have preconceptions about maple, check them at the door, because these guitars deliver plenty of the warmth, depth, richness and sustain your ears crave in an acoustic guitar, without losing the clarity and transparency that allows maple to reflect the player and fit into a mix with other instruments. All Taylor 600 Series instruments include a deluxe Taylor hardshell case for optimal fit and protection. 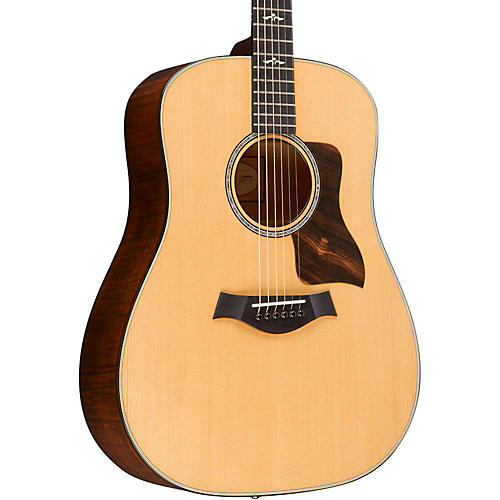 The Dreadnought is one of the most traditional acoustic guitar shapes. Taylor's version has been refined to blend its trademark robust low-end tone with a snappy midrange and brilliant treble notes, producing a pleasing balance of power and articulation. If you're a flatpicker or strummer who likes to dig in on lead or rhythm, the Taylor Dreadnought will serve you well. Traditionally known for having a focused tone with a fast note decay that cuts through a mix, our maple (back and sides) guitars have been voiced to produce greater warmth, complexity, volume, sustain and responsiveness, while retaining maple’s naturally clear, linear qualities. The clarity of the high end is still there, but the bottom end has been extended. The result is a more multi-dimensional sound that gives players the kind of musical versatility of other classic tonewoods, making Taylor's maple models a compelling choice as a primary guitar, not just a stage guitar. Taylor's maple guitars are voiced to be very reflective of the player’s technique, so a player with a dynamic playing style or someone who likes to vary their picking attack will appreciate how easily those playing nuances come through in the tonal response.